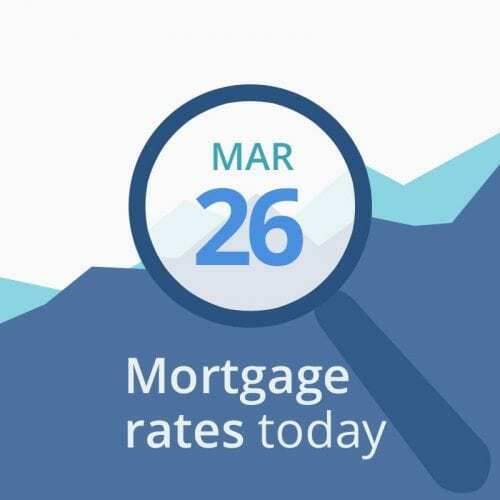 Yesterday was another good day for average mortgage rates. As we predicted, they fell again, but nothing like as sharply as they did on Friday. Still, the downward momentum triggered by last week’s Federal Reserve announcement has definitely slowed. And that might prove significant. If markets are now close to adjusting themselves to the new reality the Fed created, we could be returning to the old uncertainty. That would see them basically directionless and buffeted by small events. And remember: there’s often a bounce after sharp falls. That might already be starting this morning. The data below the rate table are indicative of mortgage rates inching upward. But they could also hold steady. So, assuming the mood doesn’t change in markets, mortgage rates look likely to ease upward today — or maybe to remain unchanged. Of course, it’s possible the Federal Reserve’s statement last Wednesday has established a long-term downward trend. But that already seems to be slowing. And you can still expect to see rises and falls within it as other risk factors emerge and recede. Worse, depending on how near you are to your closing date, you may not have time to ride out any increases. This concerns Brexit, the manner in which Britain leaves the European Union (EU), if at all. The UK seems as far away from deciding what it wants from quitting as it was more than 1,000 days ago when the leave/remain referendum was held. And that’s bad because it was due to leave on Mar. 29. Last week, the EU granted an extension until April 12. If Parliament enacts the Prime Minister’s preferred withdrawal agreement by then, a further extension into May will automatically kick in to smooth the necessary administrative processes. If Parliament declines to pass that deal (it may get a third vote on it this week but has already rejected it twice by large majorities) by the April deadline, the UK will have to settle on one of two choices. First, it can crash out without any agreement and hope to trade under World Trade Organization rules. This is the so-called no-deal option. Nearly all economists and most businesspeople think that would be a monumental folly that would cause immeasurable economic self-harm. Or, secondly, it can request a much longer extension (maybe two years) during which it can negotiate a new withdrawal agreement, or hold a second referendum or general election to break the political deadlock. Yesterday, Parliament decided to have a series of “indicative” votes in the hope of finding something members can agree on. But those motions won’t be binding and there’s no guarantee a consensus will emerge. If British politicians eventually find a sensible way forward, that would be good news for the global economy and might see mortgage rates rise. However, if the muddle continues or the country crashes out with no deal (still a possibility) in less than three weeks, mortgage rates could dip even further. Meanwhile, markets are increasingly focused on current U.S.-China trade talks. U.S. Treasury Secretary Steven Mnuchin and Trade Representative Robert Lighthizer are due to fly to China this week to put final touches to an agreement. And a similarly high-level Chinese delegation is expected in Washington D.C. sometime next week, which is the first time a text is likely to be unveiled. The administration is generally upbeat about progress. However, others see potential problems. The President’s original Mar. 1 deadline for an agreement passed more three weeks ago. But both sides badly need a good outcome, and for similar reasons: First, to burnish political prestige domestically by bringing home a win. And secondly, to step back from economic slowdowns. However, markets worry those pressures will prevent a win-win conclusion — and might even result in no deal being reached or a lose-lose one. Once the talks end, investors will digest the outcome in detail. If no deal is concluded, or if the one that’s agreed turns out to be worse than neutral for the U.S., expect mortgage rates to tumble even further. But, if it’s a win-win — or even just not too terrible and simply brings uncertainty to an end — they could rise. Last Wednesday’s Fed announcements look likely to add some downward pressure on mortgage rates in coming months. That doesn’t mean there aren’t other risks (currently known and unknown) that could see them rise, possibly sharply. And we still see grounds for caution. But that Fed announcement saw us last week adjust our recommendation to suggest that you lock if you’re less than 15 days from closing. Of course, financially conservative borrowers might want to lock soon, whenever they’re due to close. On the other hand, risk takers might prefer to bide their time. After a couple of light weeks for reports of economic data, we see more action this week. And some of the numbers, including gross domestic product (GDP) and core inflation, are top-tier indicators that markets take extremely seriously. Others to watch include personal incomes and the trade deficit. Today’s publications aren’t in those top tiers, though any report can move markets if it contains real shocks. That’s not the case today. Housing starts and the consumer confidence index, which was published too close to our deadline for us to assess its impact on markets, were both disappointing but not wildly so. Markets tend to price in analysts’ consensus forecasts (we use those reported by MarketWatch or Bain) in advance of the publication of reports. So it’s usually the difference between the actual reported numbers and the forecast that has the greatest effect. That means even an extreme difference between actuals for the previous reporting period and this one can have little immediate impact, providing that difference is expected and has been factored in ahead. Although there are exceptions, you can usually expect downward pressure on mortgage rates from worse-than-expected figures and upwards on better ones.